Today has been a day of leisure, because we are still reeling from the effects of exhaustion after yesterday’s bottling, pickling and jamming extravaganza! Our kitchen often seems to be a refuge for other people’s surplus fruit and vegetables. So this week we were absolutely amazed to take in a harvest of pears, grapes and over 4kg of quinces from Walthamstow village. We spent the day in a frenzy of activity, having a challenge on our hands to avoid waste and be thrifty and clever with this fresh and extremely local fruit. 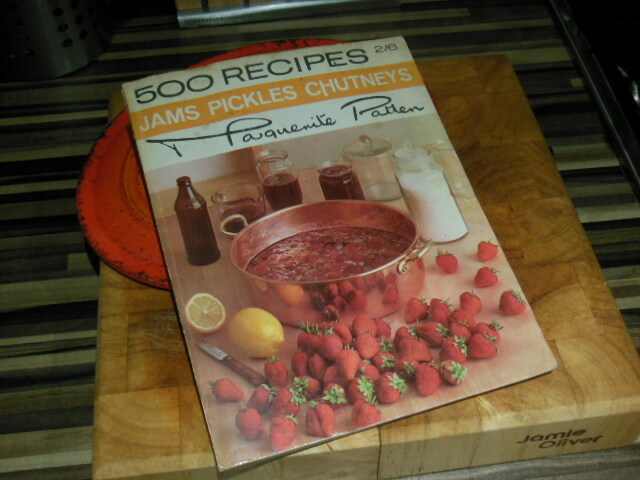 So reliant on a pile of cookbooks including a 1960’s copy of Marguerite Patten’s fantastic recipe book that cost 2/6, we made grape cheese, quince and apple jam, membrillo and preserved Xmas pears. To say that we were busy is rather understated and I fear that the kitchen floor will forever be sticky despite constant mopping! We tasted the pears which were amazing – juicy but not too soft, so we decided to preserve them as a seasonal treat for Christmas. We made 3 average size jars and 1 very large one. Prepare the pears by carefully peeling and quartering them and removing the core. Add each one as you go to a bowl of water with the juice of half a lemon to prevent them discolouring. Dissolve the sugar and water with all the spices in a large heavy-based pan or jam pan if you have one. Bring the syrup to the boil and make sure all the sugar has dissolved by scraping a wooden spoon across the bottom of the pan. 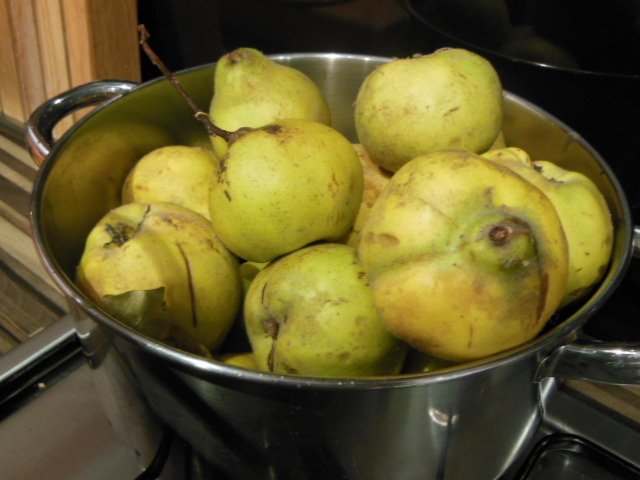 Remove the pears from the lemony water and add carefully to the jam pan. Bring the syrup back to the boil then simmer for five minutes. Wash your jars and lids thoroughly then sterilize in the oven. 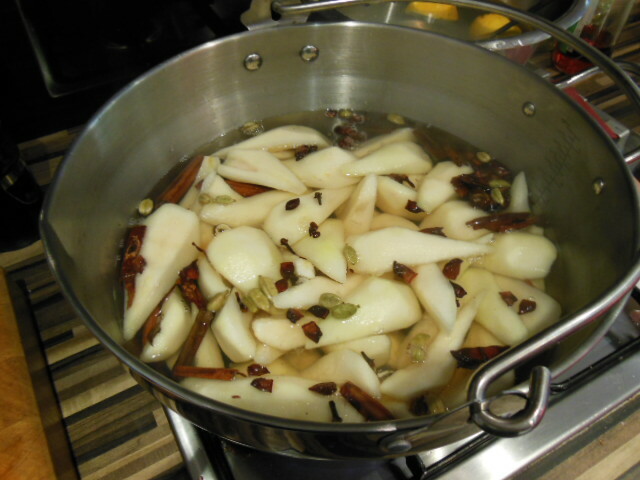 Place the pears to the hot, sterilised jars and then fill with the syrup and spice pieces. To try and preserve the pears for longer, we made our first attempt at sterlising again in a water bath. Take a roasting tin and put in a wire rack so that the jars won’t be sitting directly on the bottom of the pan. Put the jars with lids loosely-on onto the rack then add three inches of boiling water. Place the tray into the oven and cook for 40 mins at 80 C. These pears will last for up to 1 year, but the flavour of the spices will intensify with time. 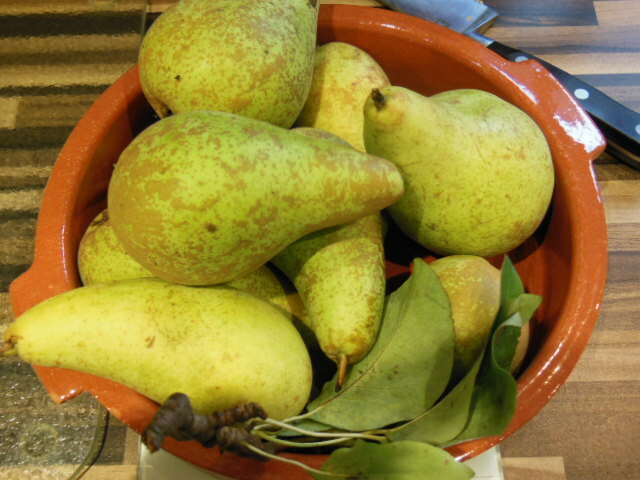 You can use the pears in baking or eat as they are with ice cream or custard. You can also wash off the syrup or add more honey and other flavours. After a long day at the bottling factory! 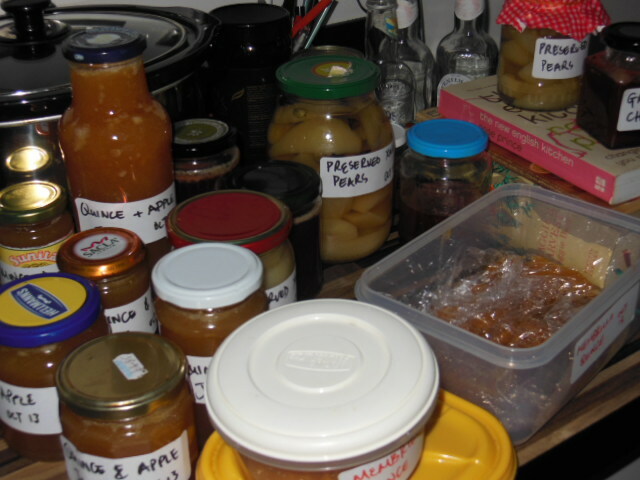 This entry was posted in Recipes and tagged christmas, Cinnamon, e17, glut, grape cheese, jam, Marguerite Patten, membrillo, Pear, preserved, Quince, Walthamstow. Bookmark the permalink.